Delpaneaux Wills’ most recent movie, “40 Days and 40 Nights,” is making literal waves with audiences. Movie Vine sat down with the actor and discussed what action movies inspire him and why it is that audiences love watching disasters so much. Katie: Welcome to Movie Vine, Delpaneaux. Katie: You have an exciting project to discuss with us today. Your new movie, “40 Days and Nights,” hit DVD shelves and Video On Demand sites on November 27th. It looks to be a modern day Noah’s Ark, but with a sci-fi twist. What else can you tell us about this flick? Delpaneaux: Well, it was a fun film to make. “40 Days and Nights” is a film about a colossal tectonic shift that causes the sea level to start rising, a microbiologist gathers the DNA of as many species as she can, while the military creates an “ark” in a desperate attempt to preserve life on Earth. Delpaneaux: I am part of a group of meteorologists that are sent out in the beginning of the film to survey the planet and atmosphere, because there were reports of huge storms brewing. Katie: How did you get involved with the project? Delpaneaux: I auditioned for another role in the film, but I did not get it. Then I was called by Gerald Webb, who does most of the casting for [independent production company] The Asylum and he offered me the role of FISHEL. The Asylum produces a lot of sci-fi films. Katie: The movie looks epic. 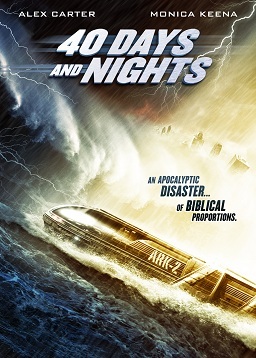 The trailer, which can be viewed here, features crazy action sequences and explosions, in addition to a giant wall of water overtaking the earth. Did you have to do any death-defying stunts while working on the project? Delpaneaux: No. I did not partake in any death-defying stunts. Most of my scenes were shot in an airplane, which was pretty safe. Although, I did get soaked a couple of times from the rain machine. Katie: Have you had previous experience with demanding action roles? Delpaneaux: Yes, I have. Playing a college vampire in the film “Darktown” was a grueling shoot. We filmed mostly at night, which means my sleep was messed up. I had lot of fight scenes and there was a lot of blood. Katie: As an actor, do you find more physical roles harder to prepare for, or easier? What sort of skills do you employ? Delpaneaux: I find that physical roles are easier to prepare for, because you can rely on the physicality of the scene to portray the message. Like, if you are a boxer in a film, most of the time people can see your emotions through the way you fight. For physical roles, I like to over-train for a project. So, that I really know what it takes to be in that world. When I do that, it seems like I can portray that character to the best of my ability. Katie: How was working with director Peter Geiger? Did he have a specific vision for the world of the movie? Delpaneaux: Working with Peter Geiger was great. He let you be yourself and have fun with character. Katie: Did you and your castmates have a good time acting on such a wild sci-fi movie? Are you a sci-fi and action movie fan? Delpaneaux: My cast mates had a great time on this film. Yes, I am a fan of all sci-fi films and action movies, specifically martials arts films. Katie: Disaster movies are extremely popular right now. In fact, directors like Roland Emmerich have made a career out of producing them in all their computer-generated glory. What do you think it is about watching harrowing natural disasters on the big screen that is so attractive to audiences currently? Delpaneaux: I think people love to be at the edge of their seat, but in the back of their minds, they know that everything will be okay. Katie: Do you think “40 Days and Nights” will satisfy that craving with viewers? Delpaneaux: Yes, I think this film will definitely satisfy the fans and their cravings. The Asylum knows the sci-fi genre very well. Katie: Have you gotten a chance to see the finished cut of the film yet? Did you enjoy? Delpaneaux: Yes, I have seen it. I loved it. Katie: In your acting career, you’ve played a wide array of characters, including some really compelling figures, such as African track star Seneca Keflezi in the Lifetime movie, “Chasing a Dream.” What’s your favorite role to date? Delpaneaux: Every character I play in a film is my favorite role to date. No, I’m kidding, Seneca Keflezi pushed me, but due to the physical nature of this role, this is my favorite to date. Katie: What do you look for in a script? What traits attract you to a role? Delpaneaux: I like to look at scripts that have human qualities. If I look at a script and after reading it, I want to call my mom and tell her I love her. Then that’s the script for me. Katie: Your acting resume features roles in sci-fi and horror movies, more mainstream TV fare like Saving Grace, soap operas, and you’ve even voiced a video game. Do you have any dream projects you’d still like to work on? Delpaneaux: Yes, I would love to be a new character on “The Walking Dead” or “Game of Thrones.” Mostly, I just want to do films that touch people’s lives. Katie: Speaking of films that touch people’s lives–what’s your all time favorite action movie? Katie: Excellent choices! Thank you for taking the time to speak with us, Delpaneaux. Delpaneaux: No, problem. It was a pleasure. Comments for Craving Disaster: Interview with Actor Delpaneaux Wills are now closed.